We love Halloween and dress up as a group every year. 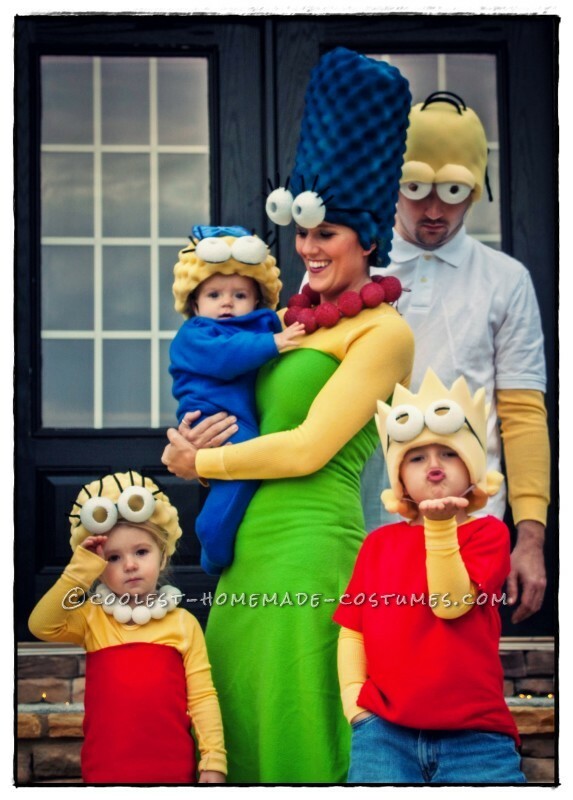 We knew from the moment we had two girls and a boy that Simpsons was on our short list for Halloween ideas. We couldn’t pass up this perfect opportunity! After much brainstorming on how to go about “becoming the Simpsons”, I decided several things: 1.) It must be cost effective, 2.) I would not be painting our skin (mother of three little children + painted skin = yellow EVERYWHERE forever and ever!) 3.) I needed to keep it simple and find a way to have continuity between the characters. My first obstacle was Marge’s hair! After many ideas floated around in my brain (wigs, bubble wrap, Styrofoam, packing peanuts, feathers, etc.) I happily stumbled across an old foam “egg crate” style, mattress topper in our basement that had never been used. Perfect! Simple! and added bonus, I could use this throughout to give continuity to our Simpsons family. :) I hot glued like nobodies business and cut with scissors to shape everyone’s “hair”. Marge got a few light coats of spray paint and was looking fabulous as ever. Homer got a few added fuzzy pipe cleaners for his trademark locks, and Lisa and Maggie got their “hair” glued onto dollar store army helmets. Our eyes were another obstacle because five out of five of us were never going to be able to see! So I bought foam balls, sliced those babies in half, and scooped out the insides. I made a hole, and hot glued them to dollar store frames. They were worn on our eyes for a few minutes, but everyone preferred them up on there heads. A quick red Sharpie to some little white shoes for Lisa was all that was needed! The rest we had on hand. 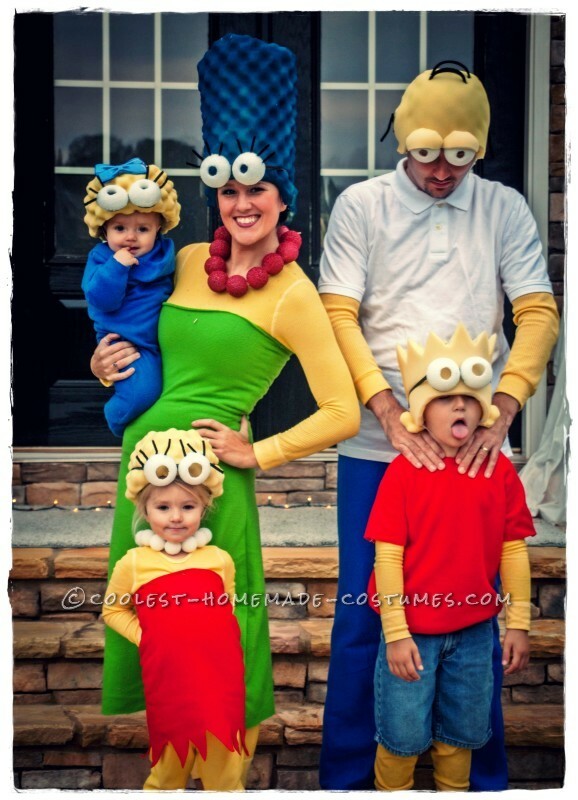 We had a blast walking around as the Simpsons. 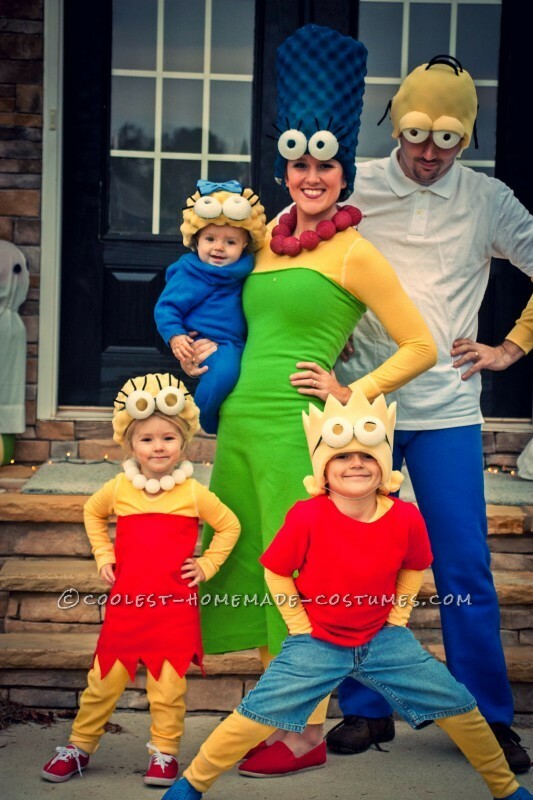 We are a family that has dressed as a group for the last six Halloweens, and as much as I would love to do this with my children and super-amazing, good-sport, supportive husband, I have heard the dreaded, “Can’t I just be a Ninja next year” comments starting. Vote for us and help me inspire my kiddos to keep up our wild family Halloween traditions! Truly amazing Monica! You always have the best ideas! I cant wait to see how you work the rest of the familys costumes around the ninja next year! Hi, i love it! Do you still have the costumes? If so, are willing to sell it?